But although opinions regarding napping vary, a little shut-eye during the middle of the day isn't only for babies and children, and it certainly isn't a sign of laziness. In fact, science proves that there are real benefits to napping — some that might surprise you. A nap doesn't take the place of a healthy diet or exercise, but it can help control your weight. There is a connection between sleep deprivation and excess pounds. If you don't get enough sleep at night, you're likely to feel hungrier during the day. Sleep deprivation can also lower your ability to burn calories, and increase your insulin level, thus raising your risk for Type 2 diabetes. A nap can make up for a bad night's sleep and help keep your weight in check. Does your food taste or smell better after a nap? Or maybe you have a greater appreciation for music after closing your eyes for 30 minutes. This isn't your imagination. According to nap researcher Sara Mednick, "a nap can be as effective as a night of sleep in improvement of perceptual skills. Driving, cooking, appreciating music or art, reading, proofreading, quality control and even bird-watching are all enhanced after a nap." To prevent a nap from disrupting your bedtime routine, and to maximize its benefits, you should plan (yes, schedule it!) to nap accordingly. If you usually wake up around 6 a.m., you'll benefit the most from a nap at 1-1:30 p.m. If you're more of a night owl who sleeps in to around 8 or 9 a.m., your sleep gate is more like 2:30-3:00 p.m. Most of us aren't able to indulge in a long nap, but a 10-20 minute power nap is all you need to get a quick boost of energy and alertness. In fact, this is the best kind of nap if you need to be mentally sharp right upon waking. To get an even bigger boost of energy, drink a cup of coffee immediately before settling down for your power nap. 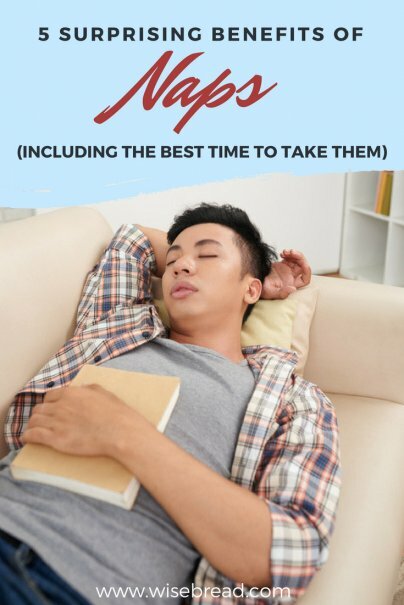 Don't go into the no man's land of the 30-45 minute nap, which causes sleep inertia and result in about 30 minutes of grogginess before you're able to do anything productive. A 60 minute nap is good for improved memory but you may experience some grogginess upon waking. If you have the time and luxury, a full 90 minute nap is optimal for creativity and rest. You get a full cycle of sleep which will limit sleep inertia and prepare you for the rest of the day. Do you take naps? Do they help you stay energized and focused throughout the day? Please share in comments!